Portal is a website that acts as the main entry point of the internet to a specific field-of-interest or an industry. It offers various essential services such as search engine, personalized content, email and links to other related sites. Portal development offers numerous functionalities within a website as per the requirements of your business. When portal plays the role of a business, you cannot compromise its performance. In order to get the best Portal Development in Dubai, do not hesitate to contact the developers at TechSupportDubai. We design your portal with an aim to make your business shine. Making and utilizing a domain specific portal is a special benefit to any web development company designing portal. Portal is one of the finest and most efficient approaches to train clients apart from a smart marketing plan. A synchronized web portal provides relevant content to the end users without any problems. Looking for an efficient Portal website development services in Dubai? Relax, you are in the right place. 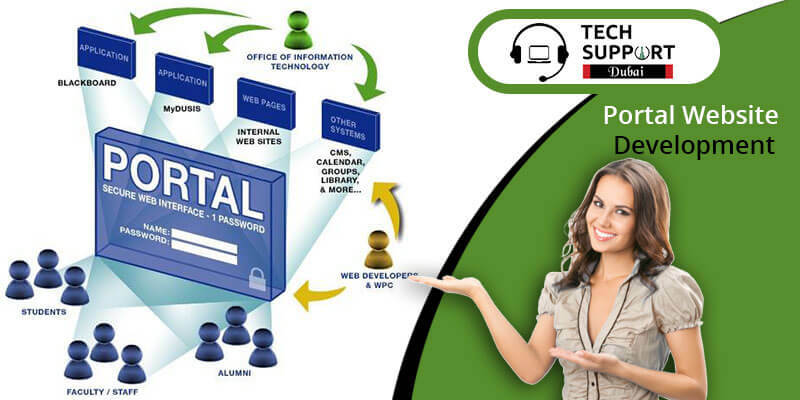 The experts at TechSupportDubai implement full scope of portal features. We apply the most suitable technologies to meet you’re the needs of your business. You can easily create a strong online image with the help of our proficient portal developers. TechSupportDubai is the best when it comes to Portal website development services. We understand the requirement of web portal development. Keeping this in mind, we design your portal. All our portal solutions such as B2B Portal or B2C Portal are of high quality and cost-effective. We use advanced technology and always ensure on-time delivery. Our developers design web portals which are attractive and customized as per business requirements. Hurry and contact us soon to get unmatched service from our developers. Place a call at our helpline number 042053349 and interact with the experts at TechSupportDubai. With an easy navigation functionality, we create your portal that enables your visitors to access with ease. We are available 24*7 to assist you for portal development. If a service charge is your concern, do not worry. We offer best-in-class Portal Website Development in Dubai without compromising with the service quality. Hurry and contact us soon as we are always happy to serve you with the best service. We also provide Shopify Ecommerce development service.